With smarter, more discerning businesses and business customers and more sophisticated search engine algorithms, 32% of marketers say they will increase spending by an average of 6% on content-focused B2B marketing in 2014 (Forrester Research and BMA). 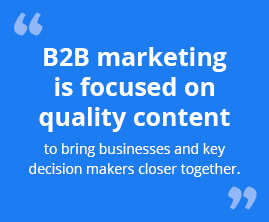 B2B marketing is focused on quality content delivered by email, blog, case study, white paper, video, e-book, podcast and social networking to bring businesses and key decision makers closer together. It’s always been about producing, distributing and analyzing that content as effectively and efficiently as possible. Today, inbound B2B marketing is increasingly critical to businesses needing to stay on top of search, social and website visibility. Throughout 2014, Inflexion Interactive has continued to emphasize the indispensability of inbound B2B marketing for its capacity to target the right traffic, to nurture leads and, eventually, to convert leads into buyers. We believe our clients must work long before (and beyond) sales conversions by creating, distributing and automating personalized content that provides relevant information. When you aim to satisfy research needs or strive to solve a problem, you communicate with each lead without focusing too heavily on conversion-only content. Read why relevant, well-researched content boosts B2B marketing. By leveraging the latest in B2B marketing for inbound activities, including website design, CMS customization and marketing automation—we’re able to dig into the data to plan custom pathways that make you a key influencer—not just a number—within your niche. What are 2014 trends in B2B marketing strategies? Where should your focus efforts? Since B2B website design and development is becoming increasingly focused on targeting specific personas, such as mobile users or CMOs of key verticals, you must know each visitor and how s/he interacts with your business-to-business site. This is a critical first step. Research and analysis, plus IA, UX and content strategy, work together to build the best inbound B2B marketing for competitive enterprises. It’s difficult to stay ahead of the curve without this data. During the creative process, you’ll quickly learn that your website is no longer about building a single solution or grid for everyone to view. This year it’s about B2B website designs that meet the expectations and viewing requirements of each persona. From tablet-view website layouts to mobile-friendly emails, we feel it’s key that you aim to build business on each key pathway. User experience design (UX design) is a key component of B2B marketing strategy, as well. Flat design ensures focused, dynamic and flexible spaces on which to feature targeted content. As we mentioned in last month’s web design blog post, flat design simplifies messaging and decreases load times, giving you more freedom to effectively and efficiently reach mobile users. Direct content for B2B marketing develops better relationships among business-to-business organizations. That’s why website development focused on inbound marketing incorporates easy-to-use content publication and distribution tools that empower marketing teams to reach out, engage and cultivate lasting business relationships online—from blog posts to emails. Add marketing automation to the mix, and you’ve built a viable web presence that can grow with you. At Inflexion Interactive, we hope to help you transform email, social and other content-focused activities into dynamic, personalized engagement. Tweet, reach out on Facebook or contact us, and let’s talk about how 2014 can be your year for better B2B marketing.